Wild Ocean Aquaculture is co-owned by Matthew Moretti (center). By the time the sun rose on a chilly November morning, Matthew Moretti and his two-man crew had steamed into Casco Bay, tying up alongside three square rafts bobbing in calm waters. Clambering onto the planks, they began hauling 35-foot ropes from the deep, each laden with hundreds of pounds of slate-gray mussels. Moretti’s business represents what marine biologists, federal officials, and some fishermen say may be the future of New England’s seafood industry, one that increasingly raises, rather than catches, shellfish and finfish. With the appetite for seafood growing, even as regulators impose tighter catch limits, researchers and policy makers are looking for ways to expand aquaculture and tap into a growing global market for seafood. Last month, the Army Corps of Engineers issued the first East Coast permit to grow mussels in deeper federal waters. It went to a Chatham fisherman, who is leasing 28.5 acres in Nantucket Sound, about 4 miles off Cape Cod and not far from the site of Cape Wind, the controversial offshore wind development. Officials of the National Oceanic and Atmospheric Administration and marine scientists consider the mussel farm a test case for deep-sea aquaculture, which, if successful, could lead to millions of dollars for New England’s beleaguered fishing industry. The fisherman, Domenic Santoro, plans to launch operations in 2016, initially cultivating 30,000 pounds of mussels a year. The leased area has the potential to produce up to 500,000 pounds annually. Last month, the Army Corps of Engineers issued the first East Coast permit to grow mussels in federal waters to a Chatham fisherman. Mike Kersula works on the crew of the mussles barge in Maine. Shellfish farming is not new; oyster platforms dot state waters and Maine fishermen have been growing mussels for decades. But doing it in federal waters represents a new approach aimed at significantly increasing production. Federal waters, which lay 3 to 200 miles offshore, present challenges such as rougher seas and longer — and more expensive — travel, but also advantages, particularly more space than is available closer to shore. Global fish consumption is projected to increase by 36 percent to 152 million tons by 2030, according to the World Bank. Most fish will be farm raised. Today, the United States imports 90 percent of its seafood, more than half raised in countries such as China, Vietnam, and India. The US market for live mussels, meanwhile, has nearly doubled within a decade, with 99 percent of the demand met by Canadian mussel farms. 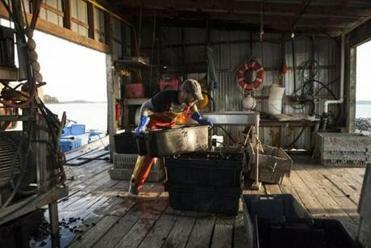 Canada has exported about 30 million pounds of live mussels, valued at $39 million, to the United States in each of the past two years, according to NOAA. Expanding aquaculture could increase the country’s share of these growing markets, providing income to fishermen and a boost to coastal economies, said Michael Rubino, director of the Office of Aquaculture at NOAA. Officials plan next year to open federal waters in the Gulf of Mexico to raising finfish, such as red drum and cobia, in underwater cages. “My agency, the Department of Agriculture, and the federal government have decided that this is a priority,” said Rubino. Moretti, 30, thought he was going to raise oysters after studying marine biology in graduate school and working on an oyster farm in Damariscotta, Maine. But four years ago, the mussel farm in Casco Bay came on the market, so he and his father bought it. Moretti said the operation required substantial investment to upgrade equipment, although he declined to provide figures, and a lot of hard work steaming to the farm, 4 miles north of Portland, at least twice a week, to harvest mussels. Today, Moretti employs three people and harvests about 250,000 pounds of mussels a year, which he sells to six distributors. The wholesale price for mussels runs $1.50 to $2 a pound. Aquaculture remains a tiny share of the US fishing industry, primarily because of concerns about the environmental impact of raising finfish, which are packed into pens in open water. Among the problems: pollution from accumulation of feces, destruction of natural habitats, and escapes of farm-raised fish, which can spread disease to, and interbreed with, wild stocks. Fishermen also have been slow to embrace aquaculture, which requires a different approach — and outlook. Aquaculture has little of the romance and freedom of fishing the open seas. Instead, it requires long-term planning, regular visits to check on gear, and initial investments that can range from thousands of dollars to millions. 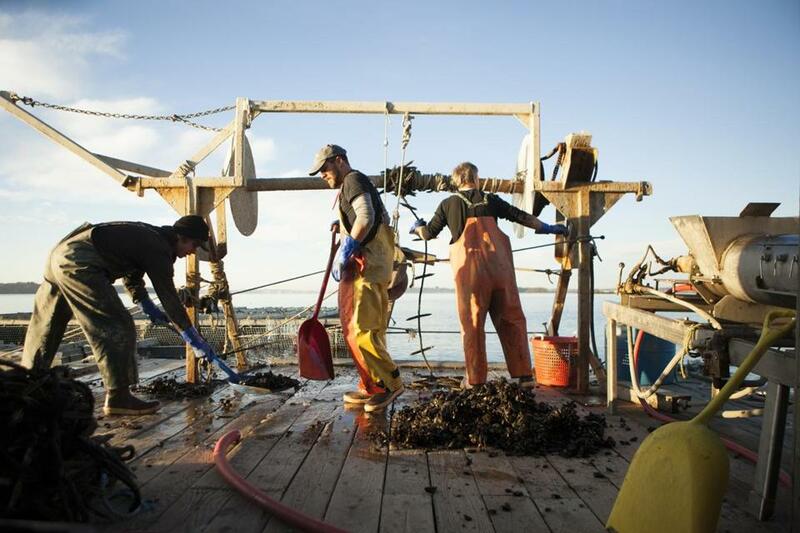 “It’s challenging working with fishermen who have been doing it for 20 or 30 years and suddenly have to become stewards, rather than hunter-gatherers,” said Scott Lindell, director of the aquaculture program at the Marine Biological Laboratory, a research facility in Woods Hole. Lindell, who has worked in the field for decades, said shellfish aquaculture is promising because it’s environmentally benign. Mussels and other bivalves such as clams and oysters act as natural filters that clean water of contaminants. In addition, said Lindell, shellfish collecting on ropes by the thousands create an artificial reef, which in turn produces a rich ecosystem for fish and other aquatic life. Lindell is an informal adviser to the only other federally permitted mussel farm, Catalina Sea Ranch, which will be developed 10 miles off the coast of Long Beach, Calif. This high-tech, $5 million operation includes weather and ocean current sensors, solar panels, and robots to send real-time data to scientists studying the operation’s environmental impact. The ranch will produce 2.7 million pounds of live mussels a year, according to Catalina’s chief executive Phil Cruver, a former tech executive. The operation in Nantucket Sound will be much smaller. Santoro plans to initially invest about $15,000, including a federal grant, to develop his mussel farm. Santoro trawled and dredged for fish and shellfish for about 20 years, but declining fish stocks and catch limits made the future uncertain. 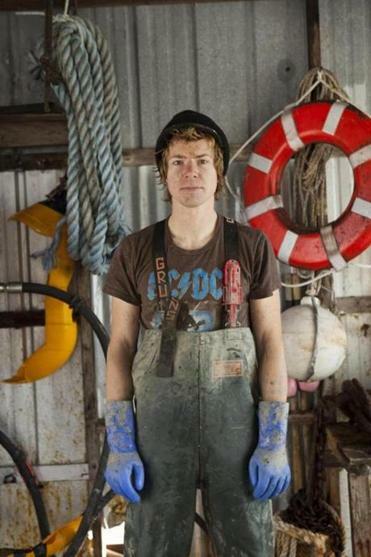 So, when he met Lindell at a workshop, he decided to try mussel farming to diversify his income. When he begins operations, Santoro each week will steer his 45-foot boat, Sweet Caroline, to the triangle of Atlantic Ocean between Cape Cod, Nantucket, and Martha’s Vineyard. He’ll employ the same “longline” growing method as used in Canada’s Prince Edward Island, the epicenter of mussel production. This method uses vertical ropes (in Santoro’s case, 60 feet long,) anchored to the ocean bottom. Between these run cross ropes, from which hang loose ropes, 10 to 35 feet in length. The mussels grow on the loose ropes. Santoro will raise native blue mussels from seed, or baby mussels, collected in Nantucket Sound. The ropes will be sheathed in plastic piping to prevent sea turtles and whales from becoming entangled, an unlikely occurrence. Santoro is diffident and cautious when he talks about the project. As in terrestrial farming, there are many variables and risks, including unpredictable weather. Only time, patience, and perseverance will tell. Lonnie Shekhtman can be reached at Lonnie.